I know you hear me. I know you see me. I can’t imagine what you think of me. The truth is, I’m not always like this. But you see, I have four children. I have *pause* two 7 years olds, one 5 year old and a 2 year old. When you have four children sometimes (or most of the time) you barely remember to call them by the right name. When you have four children you have to pause (see above) before you can tell people their ages. When you have four children it takes nothing short of a miracle to spout off all their birthdays (including year) without making a mistake or stumbling over your words. And so you see… getting into the car to go anywhere with 4 children is a thing. Not only that but between those 4 children we have 5 official diagnoses (ADHD is real, yo! X2), 3 with developmental delays and 2 currently going through further evaluations. I repeat, getting in the car to go anywhere with 4 children is a thing. Friends, neighbors, loved ones and not-so-loved ones… When you see me… standing at my front door… while a trail a children emerges from beneath my outstretched arm… know this… The words that are coming out of my mouth as I scream for them to get into the car 20 times (oh, look, something shiny), as I ask them to get themselves buckled 20 times (“that cloud looks like Mickey!! !”), as I scream for them to go back inside and put shoes on (because, seriously?! I told you 20 times inside)… Those words coming out of my mouth are not indicative of the type of mother that I am. Leaving the house with 4 children is a thing. Friends, neighbors, loved ones and not-so-loved ones… Please take this as my formal apology for my rants between your snooze button compressions in the morning. Please forgive me for the borderline inappropriate rages while you drink that calming glass of wine at dinner. And please, please know that I am truly sorry as I wail when we get home at the end of a long day while you’re getting ready for bed, because you see, going from the car to the house with 4 children is also a thing. Now please, friends, join me as I petition Kroger and all of it’s affiliates to sell wine, milk, diapers and their delicious fried chicken at their gas station island marts. Please, for the sanity of mothers all around the world, join me. I became a foster parent shortly prior to Easter. My sweet duchess, 7 years old, joined my family and life as we new it changed forever. In her short 7 years she had not experienced the security and love that my boys had experienced, much less any magic. I managed to make it through Easter without giving the magical jelly bean pooping rabbit any credit. I was proud of myself. The kids came down on Easter morning and gushed over their new fishing poles and baskets filled with lots of learning materials and toys. In the days that followed Easter, I paid attention to the conversations between the kids and their friends. They all discussed how this magical bunny paid a visit and lavished them with candy and gifts. When the duchess finally approached me regarding the topic, I was at a loss for words. Was I not good enough? Did I do something bad? Why didn’t the Easter Bunny give me anything? That was the moment in time when I decided to look deep into my black little heart and try to look for any shred of magic. I promised myself that I would at least try. The tooth fairy, I could handle the tooth fairy. The tooth fairy didn’t interfere with any of the spiritual lessons that I try to pass down to my children. I’m not sure how I escaped a lost tooth in the time between Easter and this Christmas season with either of the 7 year old or the 5 year old losing a tooth, but I did. As Christmas quickly approached, I started to purposely ignore the topic. I was not prepared. Almost as soon as Halloween was over the children started bombarded me with questions, gift requests regarding Christmas and… that awful, wretched Elf on a Shelf. Oh, that Elf on a Shelf. I’d like to find the creator of this Elf. I would find this person and trap them in a room with life-sized elves darning that same evil spark in their eyes and that wickedly creepy plastic smile. The elves would then proceed to periodically and strategically torture this person in a way that would make the Viet Cong blush. Only they’d use toilet paper and M&M’s and Hershey Kisses… and the rest of the torture devices these elves are so accustomed to using. I had finally decided to give into the peer pressure when my sweet duchess had most horrifying experience with our neighbor’s elf, Buddy, in their guest bathroom. Yes! I had gotten off the hook! Or so I thought. Over the next two days she convinced herself that it wasn’t “that bad” and they started requesting it again. But that face! I’m one of those moms. I try to find a life lesson or create a meaningful experience in almost everything that we do. So, I took to Pinterest and found this post. 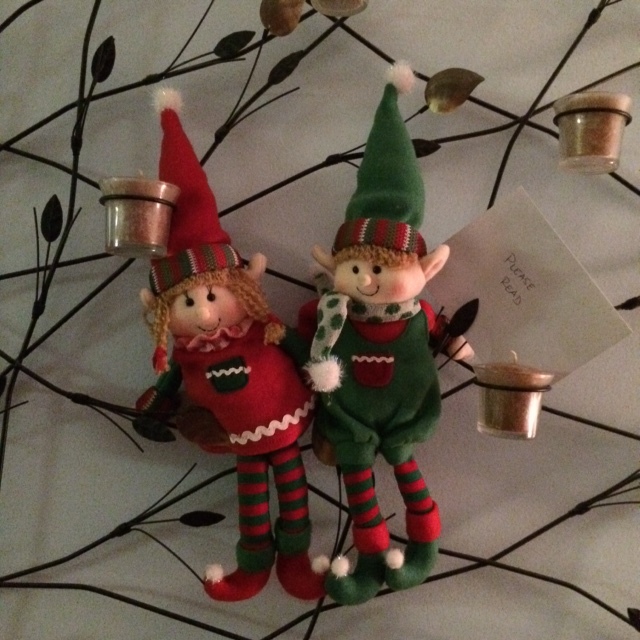 Then I headed over with my strategically started Amazon Prime trial and ordered these adorable, not creepy elves. Kindness Elves that would assign the children different Random Acts of Kindness for the next 25 days. Pass out flowers to women at a grocery store. Donate toys and clothes to a homeless shelter for families. Hand out balloons to kids shopping with their families at the mall. Candy Cane bomb kids at a restaurant. Bake cookies for a fire station. Adopt a kid from the school’s Giving Tree. Cook a meal for a family. Hand out $1 bills to kids at the dollar store to buy a toy. Hand out hot chocolate to parking volunteers at church. Hot Chocolate and thank you note for trash guys. Gift and thank you note for mailman. Gift and thank you note for a server. Chalk notes on driveway for neighbors. Sticky note compliments on cars on parking lot. Pay for someone behind us. Give a homeless person a gift card. Bake cupcakes for library workers. Mail a card and a small gift to a random stranger out of the phone book. Make Christmas flowers for the school front office staff. Tape microwave popcorn and candy to Redbox. Take coloring books and crayons to children waiting at Children’s Hospital. Send a package to a Marine that’s overseas. Take treats and thank you notes to people working at drug store on Christmas. This was one of those weekends. You know, the kind that makes you look forward to Monday morning. Yeah, one of those. When I woke up on Saturday morning I was motivated and encouraged. I had my weekend planned out to the minute. I was going to hit the gym, do some grocery shopping, buy a couple of gifts for a double birthday party the kids and I were going to later that day, and then pick up the boys from their dad’s place… all by 10am. I was that sure of myself. And so I jumped out of bed, got dressed and headed to the gym. As-soon-as-I-put-my-car-into-park at the gym my phone dinged. The boys were ready to be picked up. I let out an enormous defeated sigh as I gathered up the shattered pieces of my heart from the bottom of my floorboard, shifted my car into drive and headed that way. One of the things that is almost always constantly on my mind is making my boys into good men. Whether it’s deciding what to do or revisiting something I may have done, it is something that I am constantly weighing. Making these boys into men, good men, is my number 1 goal in life. I have been chosen to parent them and have been entrusted with caring for these two amazing, bright, beautiful children. I understand that it is my responsibility to guide them into adulthood as best I can.